Honolulu's new official bird has very close ties to City Hall. Mayor Mufi Hannemann announced the designation of the white tern or fairy tern -- also known by its Hawaiian name manu-o-ku -- as the city bird, saying it's a fitting honor. "Of all the birds I think we could've selected, this one has particular relevance," Hannemann said. One could be seen roosting high atop a tree branch next to Honolulu Hale yesterday. "It is a bird that frequents Honolulu Hale and flies around so I thought that this also had special significance," Hannemann said. "It is a creature of the sea and the land and as a threatened species, it embodies the fragile nature of Hawaii's unique environment." The white tern is indigenous to Hawaii and a threatened species that is found throughout the Northwestern Hawaiian Islands. It is the only seabird that nests in urban Honolulu. Hannemann said he didn't know that the bird found a home on the grounds of City Hall until after his staff began researching the idea of declaring the city's first official bird. Hannemann said he got the idea from Laura Thompson, mother of Hokule'a navigator Nainoa Thompson. "This bird has been a traditional ... way finder and guide for our Polynesian forefathers," Hannemann said. 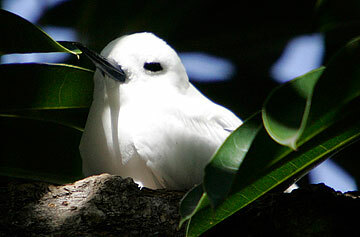 According to the Polynesian Voyaging Society Web site, mariners use seabirds like the white tern to find land. Laura Thompson, along with representatives from the Polynesian Voyaging Society, the U.S. Fish and Wildlife and the Audubon Society, were on hand for the announcement as groups in support of the designation.